It’s hard to fathom that some of the most anticipated whiskey releases in recent years are named after, well, colored spots. 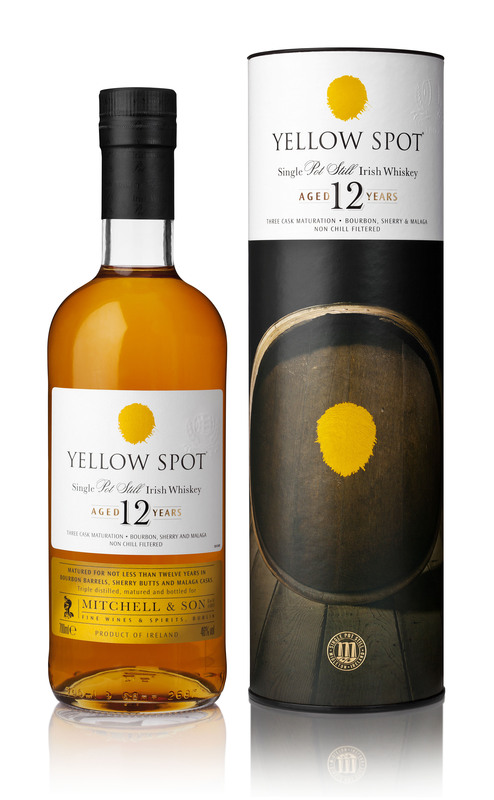 Yellow Spot originated in the late 1800s — there were a whole host of “Spot” whiskies made by the Mitchell family back in the day, including the beloved Green Spot, which were made at Jameson and placed into a variety of empty barrels provided by the Mitchells then aged back at the Mitchell cellars. This practice was known as whiskey bonding and was quite popular in the first half of 20th century Ireland. By the 1960s nearly all the Spots had vanished (along with much of the rest of the Irish whiskey industry), and eventually Green Spot was handed over to Irish Distillers in the 1970s. Green Spot — finally — came to the U.S. last year, and now Yellow Spot, formally relaunched in Ireland in 2012, has arrived on our shores, too. But you maybe knew all that. Here’s what the experience of this newly available dram is like. The nose is fresh cinnamon rolls, dense honey, raisins, and lots of mixed, fresh fruits. Notes of crushed red pepper emerge over time, lending heat to the aroma. The palate is grainy and full of notes of fresh biscuits, crushed cookies, and, later, vanilla custard and butterscotch. The finish is lightly nutty, warming, and loaded with more granary notes. Some sea spray and iodine sneaks in there, before a marshmallow sweetness takes hold to finish things off. The Yellow Spot 12 is a very good Irish whiskey. I have to say, however, that the $95 price tag is a little shocking. I had a friend bring me a bottle this and a bottle of Writer’s Tears from Ireland a few years ago. I thought the Writer’s Tears was better, IMHO. Got a bottle of it, and, while it’s enjoyable… the $106 price tag is absolutely ridiculous. Certainly a complex, wonderful whiskey, though! Is there any reason that the price is as high as it is? All whiskey pricing today is a matter of supply and demand.